It’s been a challenging week at the Homegrown Revolution compound. We lost one chick, bringing our nascent flock down to two. We decided that since chickens are social animals to add two more in case of other unforeseen problems bringing our total up to four. Such are the cycles of life and death on the new urban homestead. Some very difficult to photograph chicks have arrived at the Homegrown Revolution compound courtesy of East Valley Tack and Feed. 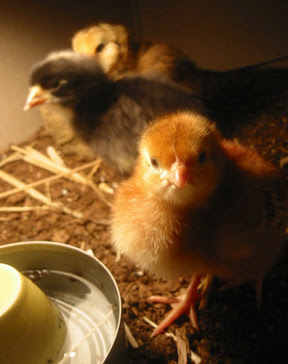 We have just three to start with–an Araucana, a feisty Rhode Island Red, and a Barred Rock. We’ll describe the luxurious coop, dubbed “Chicken Guantanamo”, and our improvised brooder later . 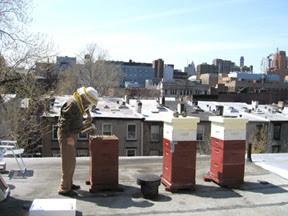 . .
Homegrown Revolution spoke to urban beekeeper John Howe today who keeps a couple of hives high atop the roof of his home in Brooklyn New York. He got the idea to take up urban beekeeping when one day a bee landed on his plate while he was eating at an outdoor restaurant and now his hives produce around 150 pounds of honey a year which he sells at a couple of locations in Brooklyn. He’s self taught and figured out beekeeping more or less on his own thanks to the internet, books, a little help from a beekeeping club in Long Island, and advice from a beekeeping supplier. Howe said that the key to urban beekeeping is maintaining good relations with the neighbors since bees have a tendency to swarm on occasion and people are always shocked to see a basketball sized cluster of bees hanging out on a local light post. He deals with these sticky situations through careful neighborhood diplomacy and, of course, free honey. Howe argues that his honey is more organic than commercial honey since his bees pollinate plants in an urban location that does not have the sort of intense insecticide application seen in agricultural areas. Since he’s the only beekeeper in the neighborhood he knows that when he sees a bee in the two nearby parks they probably belong to him. Howe’s suspects that in addition to pollinating the local plants and trees his bees also collect pollen from cut flowers at outdoor florist stands. Homegrown Revolution wishes that we could end this story musing about a bright future for urban beekeeping, a future in which each neighborhood has a beekeeper to pollinate the many fruit trees that should grow on our city’s streets, but sadly bee news these days is on the depressing side. If the Albert Einstein quote is correct we’re in trouble since bees have been disappearing in the past year due to a phenomenon known as colony collapse disorder, in which the hive flies off and simply does not return. The cause of this mysterious problem is not yet known, but many beekeepers including Howe suspect that pesticides may be the culprit. Upwards of 30 to 60% of hives in 24 states have vanished in what could prove to be a huge economic and ecological disaster since many crops including almonds and avocados depend on bees for pollination. 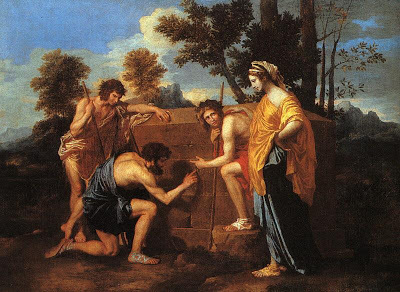 Howe himself has lost one hive. Read more about this depressing story on the BBC and it that ain’t enough doom and gloom, there’s the tale of an insecticide called fipronil, sold in the US under the brand names MaxForce and Combat, which is suspected in the deaths of billions of bees in France. Speaking of the symbolism of the beehive Robert Macoy said, “It [the beehive] teaches us that as we came into the world rational and intelligent beings, so we should ever be industrious ones; never sitting down contented while our fellow-creatures around us are in want, when it is in our power to relieve them without inconvenience to ourselves.” Pesticides are the crutch of the lazy, and it’s time for us all to figure out better, more enlightened forms of agriculture in order to save the industrious and essential bee. And it’s time for more urban beekeepers like John Howe. Pay a visit to his website and blog and buy a jar of his honey if you find yourself in Brooklyn.